Riki's official artwork from Xenoblade Chronicles. Riki (リキ, Riki) is a character from the Xenoblade universe. He is a Nopon and the supposed "Heropon" from his culture's prophecies, and one of Shulk's party members. In Xenoblade Chronicles, Riki is one of Shulk's party members, being the second last playable character to join the team. He is a resident of Frontier Village, the Nopon village, and has been assigned the yearly position of "Heropon" by Dunga the village elder. As the Heropon, he is told to join Shulk and his party to help defeat the Telethia rampaging through the forest. 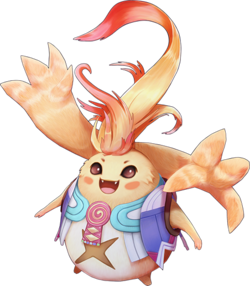 Riki quickly reveals that he was selected as Heropon not because he is skilled or special, but as a way to work off the massive debts accrued by his many children's appetites. Once the Telethia is defeated, Riki is told to continue travelling with Shulk and assist him as needed, which while again framed by the elder as prophecy, is easily seen by everyone as a way to get rid of him. Afterward, Riki has almost no effect on the plot at large, and only serves as occasional comic relief. Much like his appearance, Riki is a very childish character. He is very enthusiastic, gets hungry easily, speaks in a largely childish matter, refers to the party as "Heropon and sidekicks", and often thanks himself for contributing more than he actually did in any given situation. However, as a 40-year old married father of eleven (to the surprise of non-Nopon), he is surprisingly knowledgable with interpersonal relationships; he relates to Dunban's difficulties of taking care of younger family members, and tries to support Melia by reading her hidden emotions and weaknesses. While Riki is presented as goofy and ineffective in plot, he has a variety of useful skills in battle. He wields several arts that have unusual effects that can be stacked together, many of which hit multiple foes. He has an even spread of physical and ether attacks, an effective healing move, and the most health of any playable character. His talent art is Yoink!, which allows him to steal items, stat boosts, and experience points from enemies. But while Riki can do a lot of things, he is not the best at any of them - he can't get enough enemy attention to effectively utilize his high health, his stats are very middling, and everything he can do can be done more consistently by someone else. As a result, he can fill a variety of roles in many party compositions. Riki's six arts as an Assist Trophy all originate from his available arts in Xenoblade Chronicles, with similar effects. He also participates in Shulk's Final Smash, Chain Attack, in a similar way to the Chain Attack mechanic in the original game. During the Final Smash, Riki can be seen attacking with his Biter, a weapon specific to him, and also using a seventh art, Lurgy. Riki appears both as an Assist Trophy and part of Shulk's Final Smash. All of his voice clips are directly ripped from Xenoblade Chronicles. Upon being summoned, Riki will announce "Leave it to Heropon! ", and once his time is up, he disappears while saying "All go to plan!" Riki alongside Shulk in for Wii U. Happy Happy raises the launch and attack power of all fighters. Riki announces "Happy, happy time!" when using it. Freezinate can freeze nearby opponents. Riki will announce "F-f-f-Freezinate!" while using it. Yoink! pulls items close to Riki. Riki giggles before saying the name of the Art. Bedtime puts opponents to sleep. Riki says "Sleepy, sleepy... bedtime!" while using it. You Can Do It heals all fighters in a certain range. Riki announces the Art's name while doing so. Roly Poly trips opponents if they're on the ground. Riki says the line "Roly, poly, keep on rolling!" while doing so. Riki, alongside Shulk and Dunban during Chain Attack. Riki appears in Shulk's Final Smash. He is summoned alongside Dunban to use a Chain Attack on the trapped opponent, before Shulk sends the foe flying. In this Chain Attack, Riki's appears to use his Lurgy Art. Riki appears as a blue item: when selected, it draws all nearby items to the user as they walk. Shulk's yellow costume is based on Riki's color scheme. Riki trophy in for Wii U.
Riki trophy in for 3DS. A Nopon from Frontier Village in Xenoblade Chronicles. Despite appearances, this year's legendary Heropon is actually a middle-aged father of 11. If you summon him in this game, he'll use Arts to knock over your foes, freeze them, and even send them to sleep. Riki can also heal you, but if he does, he'll heal everyone else too! Riki reprises his role as both an Assist Trophy and as part of Chain Attack, Shulk's Final Smash. Training Mode describes his Assist Trophy: Applies various effects to fighters. Can't be KO'd. Riki using You Can Do It. Shulk's introductory poster, also featuring Riki. Riki is one of six Assist Trophies to appear in a second capacity within a single game, appearing in Shulk's Chain Attack. The others are the Hammer Bro., the Starman, Lakitu & Spinies, the Chain Chomp, and the Metroid, all of which appear as enemies in Smash Run; Hammer Bro. also appears as an enemy in the Subspace Emissary mode. Riki is also the only such Assist Trophy to not appear as an enemy in Smash Run. This page was last edited on January 13, 2019, at 20:40.